Founded in 1980, the Legendary Pink Dots occupy an important and individual place in the field of experimental and psychedelic music. The band is fronted by singer, lyric writer Edward Ka-Spel and keyboardist Phil Knight alias The Silverman with Niels Van Hoorn (Saxophone), Martijn de Kleer (Guitar) and Raymond Steeg (Sound) forming the current line-up of the band. Their sound is often made up of a complex conglomerate of electronics, saxophones, guitars, drums and Ka-Spel’s distinctive voice and unique lyrical invention. 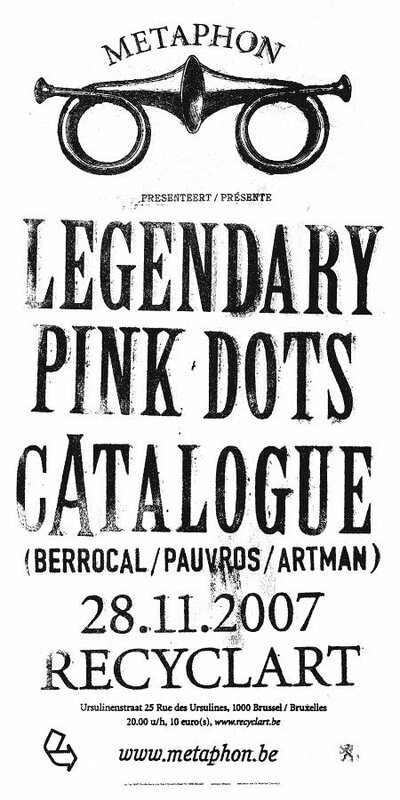 What a long strange trip it has been… It was back in August 1980 that The Legendary Pink Dots was born in a crumbling squatted house in East London. Expectations were not an issue back then as the passion was all-consuming – this was something that simply HAD to last. Indeed it would seems that The Dots have hardly paused for a breath since those quizzical yet confident candlelit sessions. For sure, band members came and went ,especially in those early days, for such an intensity is not for everyone- yet founder members Edward Ka-Spel and Phil Knight (The Silverman) are still there, mad as ever, far too lost in the music to wonder where the next meal is coming from. 25 years and such is the musical ambition of The Dots that the occasion almost slipped by unnoticed. However the acknowledgement of this landmark means that the band now has to present something worthy of such a lengthy endeavour..